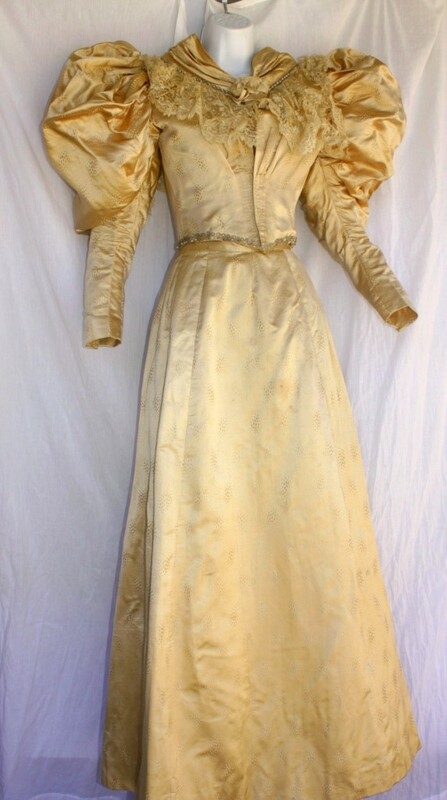 DESCRIPTION: This gorgeous gold silk Ballroom Gown is a beautiful example of workmanship and is absolutely stunning! The bodice of the gown is a marvelous creation. There is almost a built in corset here with an inside corseting attached to the dress. 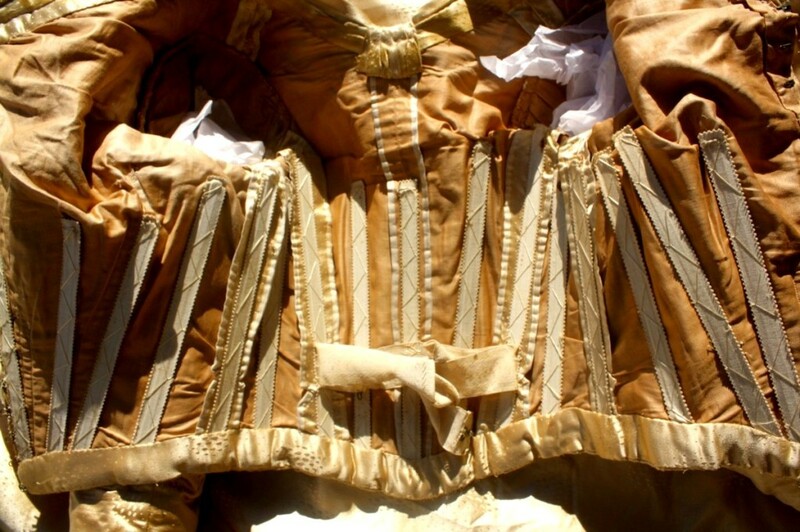 I count 16 whale bones hand sewn into the interior of the bodice, which closes with a hook and eye closure at the center front. A lovely hand made fabric flower of the same silk serves to hide the top closure. The lining is a polished cotton and is remarkably preserved, showing no sign of staining or discoloration in fabric often found in the under arm area. The trim-work on the bodice is lovely, with tiny pearls surrounded by the smallest of seed beads. 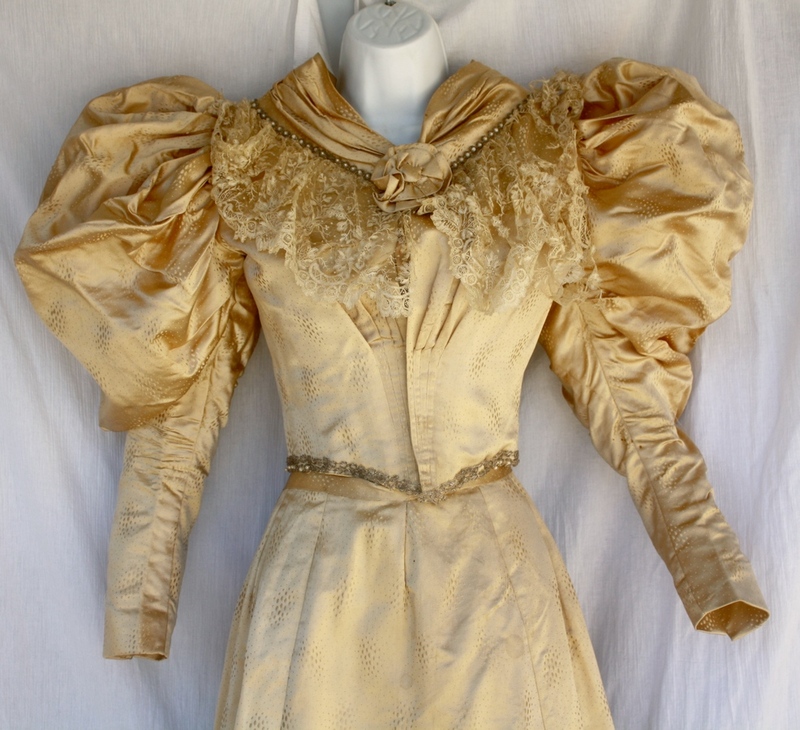 The huge sleeves are an excellent example of the 1890's "Leg O' Mutton", which epitomizes its time period - by making the shoulders look broader, the waist and hips look smaller. 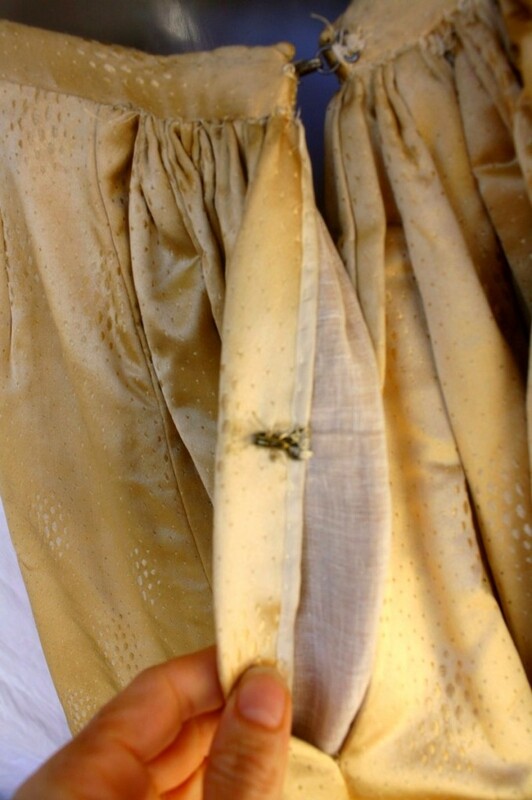 The fitted under sleeve is tight on the arm, with the puffed silk over sleeve flaring above it.The antique lace yoke has unfortunately deteriorated on the left hand side and appears to be beyond repair. With all the fabulous antique lace available here on eBay, replacing this should not be too big of an endeavor and well worth the effort. The skirting is as spectacular as the bodice. 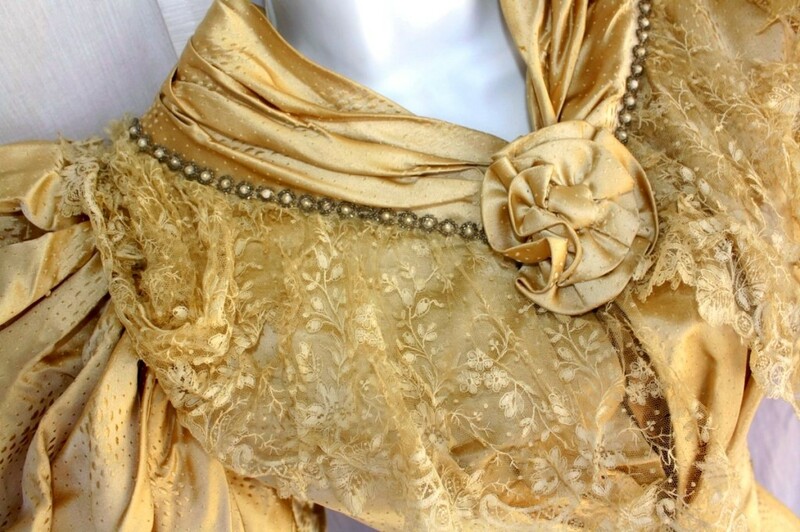 This is fashioned of the same silk, and is trained. There is even room to add a small bustle pad in the back. Cotton musslin serves as the skirt lining and there is scalloped polished cotton along the hem line to add body. The bustle tie remains and is made of 2 inches wide satin in near perfect condition. SIZE: This is an extremely TINY gown! 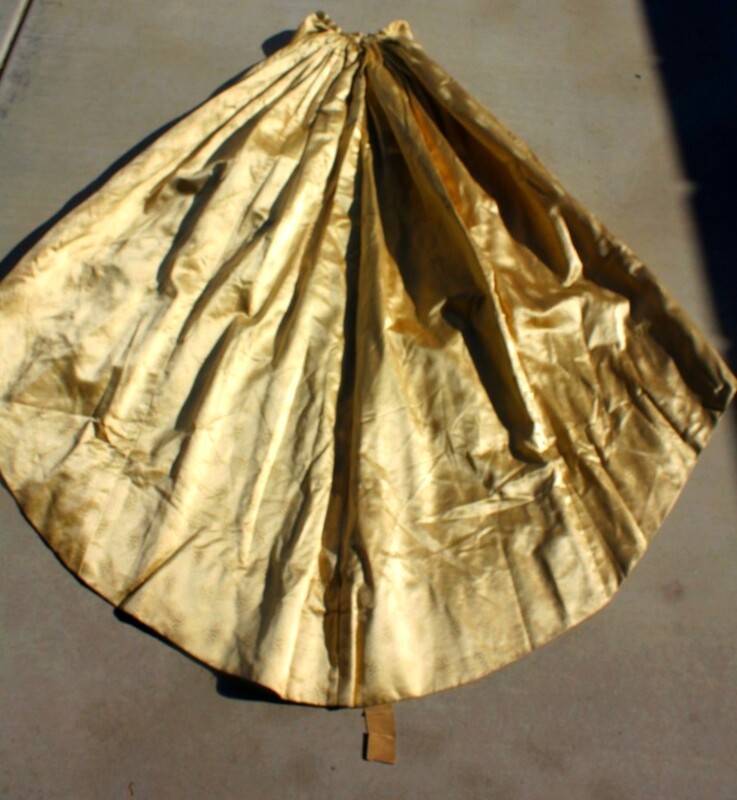 The waist of the skirt measures 24" inches around. The length of the front of the gown measures 43" inches. The length of the back (Train) of the gown measures 57". Both measurements taken from the waist of the skirt. The bodice waist when closed measures 22" inches with a bustline of 28" inches around. The sleeve length measures 24" from shoulder to wrist. CONDITION: This Ball Room Gown is in remarkably good condition with only a few exceptions. As stated above, the lace work at the yoke is in need of replacement, simply too brittle to repair. There are a few of the pearls missing on the bodice trim. As seen in the photos, there are a few spots on the bodice that I believe will come out when professionally cleaned. The skirt is in equally wonderful condition with even fewer spots (I count 3 pin head size spots), and the slightly soiled hem will benefit from the professional cleaning. The over all condition of this remarkable gown is excellent, showing very little signs of it's true age! The silk remains very strong and shows no signs of weakness like splitting or shattering. The lining is stable and intact on both skirt and bodice. This Museum Quality Antique Victorian Ball Gown is a Historical Treasure, and will make a wonderful addition to the lucky winner's collection! Not bustle ties and not a ball gown. 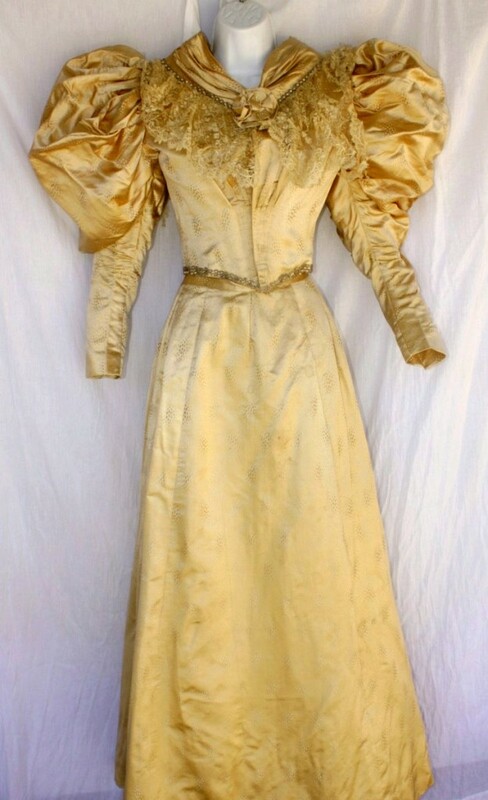 This is most likely an evening or dinner gown. 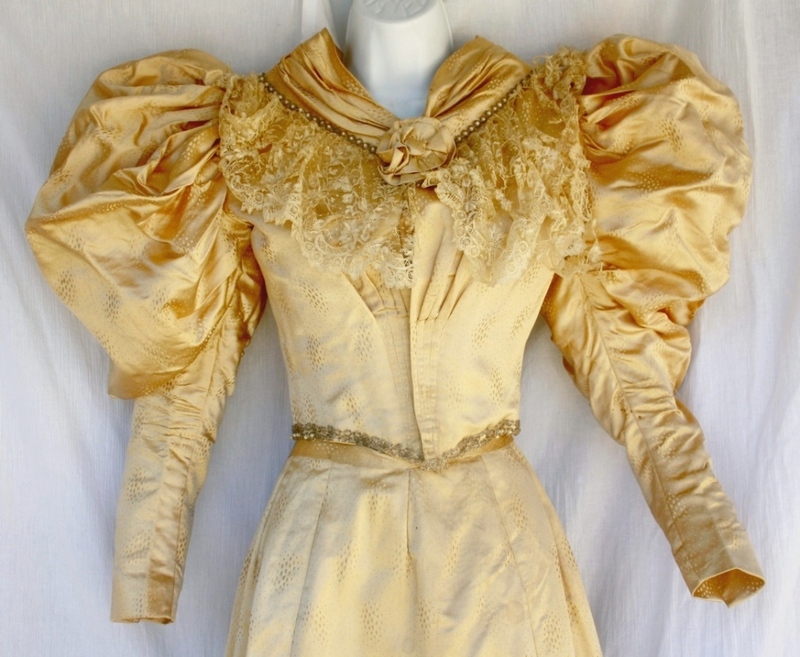 It is lovely, however, and a good example of the 1890's.